It is a measure of Blake’s creative spark that his work remains disturbing and immediate, after two centuries and scores of English professors have tried to dull it down. First things first. What about that “symmetry”? Does it rhyme with “eye”? NO! Now, having delivered that insight, what do we make of that fact? Scholars have argued whether there is meaning to be found in that jarring non-rhyme starting and ending a poem otherwise tightly rhymed. See what I mean about English professors? They are like law students pondering whether a crystal vase can be considered a “deadly weapon” to support an assault charge when it is used to kill someone. Of course it can, and if you weren’t trying to be so smart, you wouldn’t even have to ask the question. The burst expectation of a rhyme rings out like a cannon shot, and it uses the word “symmetry” to break up the symmetry. And yet some tweedy intellectuals insist that the lack of a rhyme is incidental, and that the real point is a focus on meter. Which isn’t to say that the meter of the poem isn’t also deserving of attention. He employs trochaic rhythm, the left-handed twin of iambic rhythm. Instead of da-DAH, trochees go DAH-da. Trochees are more immediate and punchy than iambs, and Blake adds an extra jab by eschewing the final unstressed syllables at the end of each line. All of which leads to the question of what this poem means. If you need a simple answer, I would go with “it presents the question of whether good and evil share a common source.” That’s an adequate answer. But there’s so much more going on in this poem! Like my favorite Blake poem, The Rose, there are continents of meaning to be found in this small poem. Notice the admiration the author expresses toward the tiger – clearly, he is drawn to this bright, fearful beast. And he mentions the lamb – an animal he had previously addressed with the same question of where it comes from, and a loaded metaphor for God and Christians. In the context of the poem, who would not find the tiger a little more thrilling and attractive than the lamb? And how should we take the questions? Is it merely a rhetorical device to ask whether the maker of the lamb also made the tiger, or is it really a questioning of monotheism? “Did he smile his work to see? 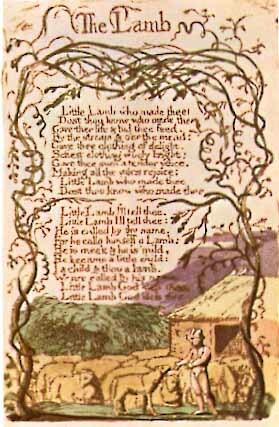 Did he who made the Lamb make thee?” We know that Blake was a Christian, so we assume that he was answering himself with an “of course”, but in the final stanza, he asks “What immortal hand or eye/Dare frame thy fearful symmetry?” Dare?! Doesn’t that imply that the immortal hand has something to fear? It’s strange that “The Tyger” is widely anthologized and often offered up as kind of a nursery rhyme for children. Read carefully, it’s a troubling and confusing poem. This entry was posted on Sunday, May 3rd, 2009 at 8:45 AM	and is filed under Sunday Poetry, arts, diversions, poetry. You can follow any responses to this entry through the RSS 2.0 feed. You can leave a response, or trackback from your own site.